It's funny how this design came about. A large knitting and crochet convention was coming to town and I needed a project to work on that was more portable than the cobweb lace shawl that I had on the needles. After a couple of swatches, I settled on Matsudana. 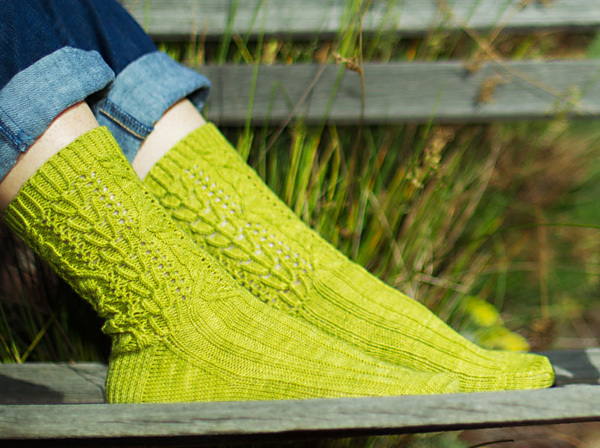 It's hardly the mindless knitting project that I thought I'd have in my project bag, but with cable crossings, lace panels, and twisted stitches, the socks are pretty and definitely not boring. Oh yes, and they are portable. 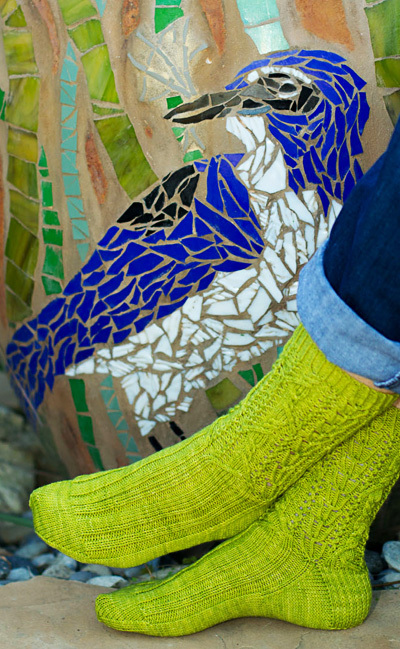 This cuff-down design has a main cable and lace panel down the front and back of the sock and a twisted stitch panel down each side. The center motif extends ever so slightly into the heel flap as well as the instep where it transitions into a rib pattern to make it more comfortable when worn in shoes. But honestly, who would want to hide these beauties in footwear? Shown in M on a US size 8.5 woman's foot. Springtree Road Muscadine Sock [75% superwash merino, 25% nylon (polyamide); 460yds/421m per 100g skein]; color: Leafy Seadragon, 1 skein. Note: Making the large size will require close to all of the 460 yards and is dependent on your gauge. If you''re concerned about running out of yarn, instructions are provided for shortening the leg. RTD (Right Twisted Decrease): Sl1 st purlwise, sl1 st as if to ptbl, return both sts to left needle, k2tog. LTD (Left Twisted Decrease): K2togtbl. CTDD (Center Twisted Double Decrease): Slp1, k2tog, pass slipped st over. C4R: Slip next 2 sts to cn and hold in back of work, k2; k2 from cn. C4L: Slip next 2 sts to cn and hold in front of work, k2; k2 from cn. C3R: Slip next st to cable needle and hold in back of work, k2; k1 from cn. C3L: Slip next 2 sts to cn and hold in front of work, k1; k2 from cn. T2/1R: Slip next st to cn and hold in back of work, k2; p1 from cn. T2/1L: Slip next 2 sts to cn and hold in front of work, p1; k2 from cn. CO 56[64, 72] sts. Distribute across needles as you prefer and join to begin working in the round. Note or mark beginning of rnd. Ribbing Round: [K1 tbl, p1] around. Repeat Ribbing Round until work measures 1 inch. Note: To shorten the leg of the sock, instead of working 2 full repeats of Chart A as instructed below, start Chart A on row 17[19, 21], work to the end of Chart A, then work all 32[36, 40] rows of Chart A. Continue with Chart B. 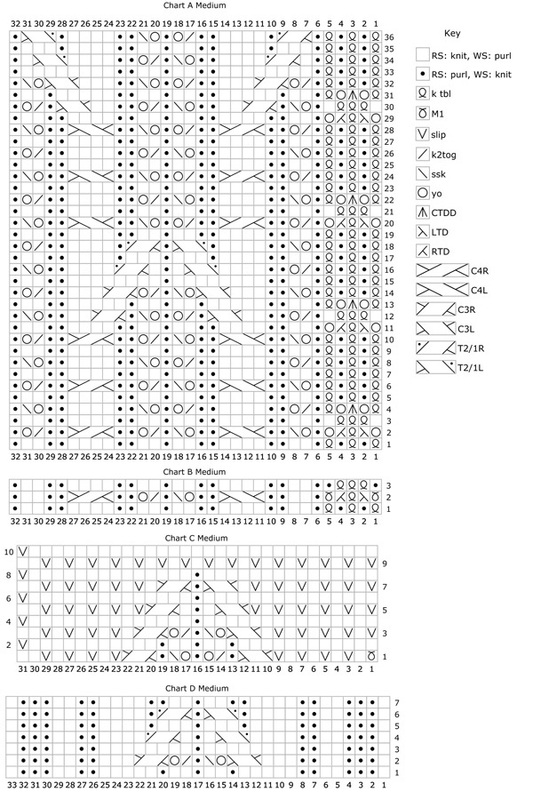 Leg rnd: Work Chart A twice across round. Work until you have completed 2 full repeats of Chart A. Next rnd: Work Chart B row twice across round. 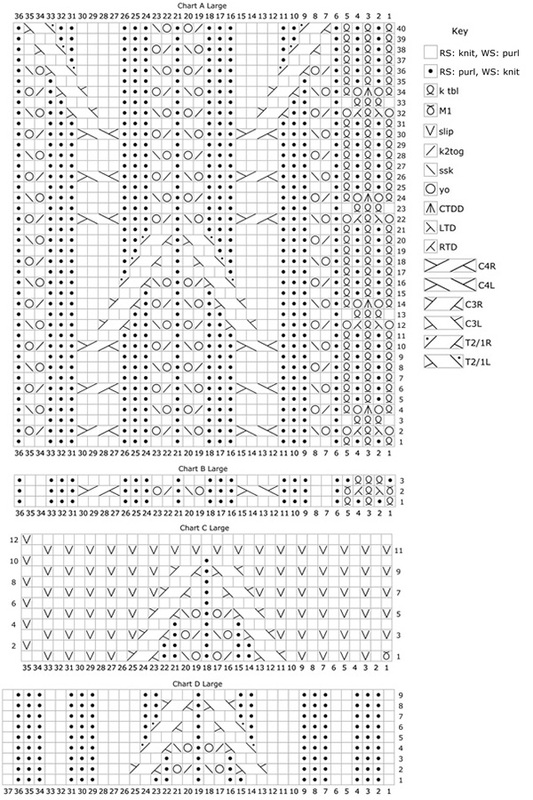 Work until you have completed Chart B.
Set-up: P1, M1, CTDD, M1, p2, k2, p1[2, 3], k2, C3L, p0[1, 2], k2tog, yo, p1, yo, SSK, p0[1,2], C3R, k2, p1[2, 3], k2, p2, M1, CTDD. 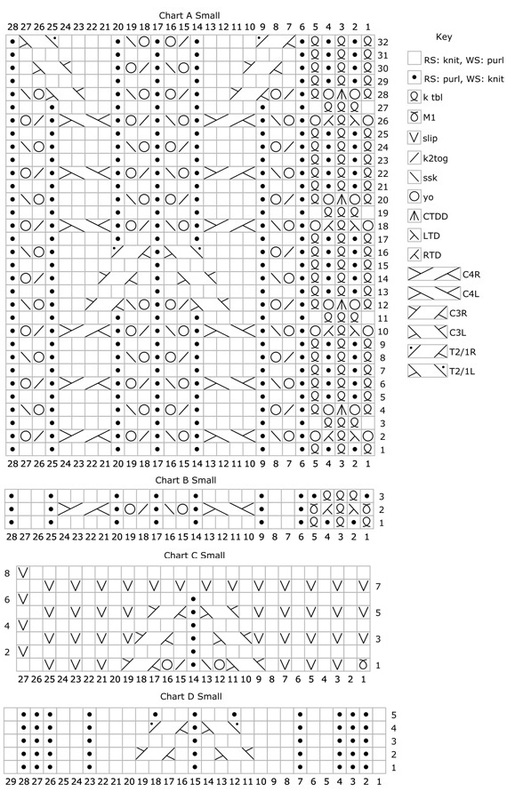 Heel Flap row 1 [RS]: Work Chart C across. Work until Chart C is complete. Repeat the last 2 rows of Chart C 12 more times. 32[34, 36] Heel Flap rows. 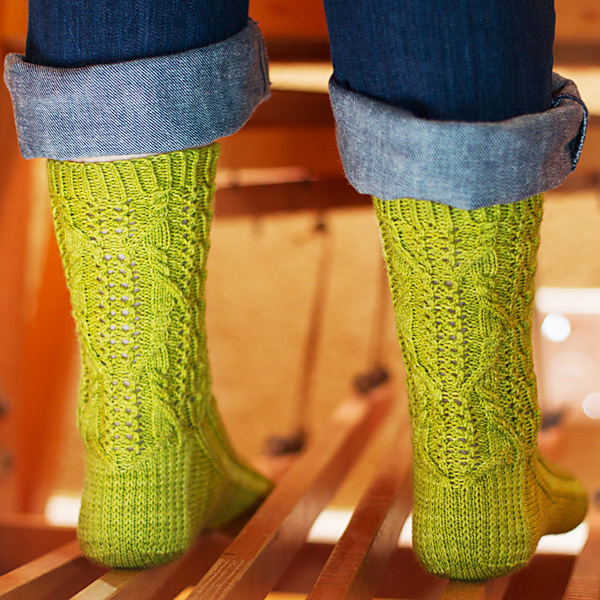 Note: If you have a large instep, you may wish to work more repeats of the last 2 rows of Chart C to create a longer heel flap, adding height to the foot of the sock. If you do this, be sure to pick up more gusset sts and work more gusset decrease rounds accordingly. Row 1 [RS]: Sl1, k15[17, 19], SSK, k1. Turn. Row 2 [WS]: Sl1, p6, p2tog, p1. Turn. Row 3 [RS]: Sl1, k7, SSK, k1. Turn. Row 4 [WS]: Sl1, p8, p2tog, p1. Turn. Row 5 [RS]: Sl1, k9, SSK, k1. Turn. Row 6 [WS]: Sl1, p10, p2tog, p1. Turn. Row 7 [RS]: Sl1, k11, SSK, k1. Turn. Row 8 [WS]: Sl1, p12, p2tog, p1. Turn. Row 9 [RS]: Sl1, k13, SSK, k1. Turn. Row 10 [WS]: Sl1, p14, p2tog, p1. Turn. Row 11 [RS]: Sl1, k15, SSK, k1. Turn. Row 12 [WS]: Sl1, p16, p2tog, p1. Turn. Row 13 [RS]: Sl1, k17, SSK, k1. Turn. Row 14 [WS]: Sl1, p18, p2tog, p1. Turn. 17[19, 21] heel sts remain. Round 1: Sl1, k16[18, 20], pick up and knit 17[18, 19] sts along the side of the heel flap; pm for instep, work 29[33, 37] instep sts from Chart D; pick up and knit 17[18, 19] sts along the side of the heel flap, k9[10, 11], pm for beg of rnd. Sole/gusset: 51[55, 59] sts, instep: 29[33, 37] sts. 80[88, 96] sts total. Round 2: Knit to 2 sts before the instep marker, k2tog, work 29[33, 37] sts in established pattern from Chart D, SSK, k to end of rnd. 2 sts decreased. Round 3: Knit to the instep marker, work 29[33, 37] sts in established pattern from Chart D, k to end of rnd. After completing Chart D, repeat the last row of Chart D for the remainder of the instep and foot. Repeat Rounds 2-3 until 27[31, 35] sole sts remain. 56[64, 72] sts total. Foot round: Knit to the instep marker, work 29[33, 37] sts in established pattern from Chart D, k to end of rnd. Repeat Foot round until foot is approximately 1.5[1.75, 2] inches shorter than desired length. Remove beg of rnd marker, knit to the instep marker. This is the new beg of rnd. Place a marker or rearrange your sts as you desire. 29[33, 37] instep sts and 27[31, 35] sole sts, 56[64, 72] sts total. Round 1: K1, SSK, k23[27, 31], k2tog, k1, pm for center of round, k to end of rnd. 54[62, 70] sts. Round 3: K1, SSK, k to 3 sts before before the center marker, k2tog, k1, slip marker, k1, SSK, k to 3 sts before end of round, k2tog, k1. 4 sts decreased. Repeat Rounds 2-3 7[9, 10] more times until 22[22, 26] sts remain. Janice knits, spins, and dyes fiber in her home in Northern California. In her spare time she also sings backup in a band -- her fellow band members often see her knitting during down time at rehearsal and soundcheck. 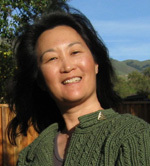 You can follow Janice on her blog, view her projects and patterns on Ravelry.